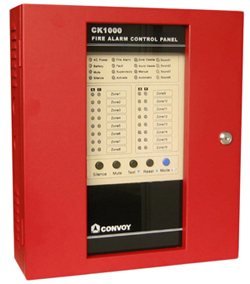 CK-1016 Fire Alarm System 16 Zone ราคา 32,000. 90 to 270VAC, 50 Hz, 3.0 amps. Wire size: minimum 14 AWG (2.0 mm2) with 600-volt insulation. Maximum battery charger capacity: 18AH battery. 1. Four to Sixteen Style B (Class B) Initiating Device Circuits (IDCs). 2.All zones accept two-wire smoke detectors and any normallyopen contact devices. 3.Zones 1 - 16 configured as general alarm zones. 4.All circuits are power-limited and supervised, meeting the latest ULC requirements using fuseless technology. 1.25 amps of NAC power. 3.00 amps of total system power. 6.Alarm, Trouble and Supervisory, relay output. 24 volt operation. 7.Resettable four-wire smoke detector power @ 500 mA. Nonresettable power @ 500 mA. 8.Integral battery charger capable of charging up to 18 AH batteries (batteries over 4 AH require use of the external battery backbox, or ULC listed equivalent). วันที่ 9/10/2017 เวลา 16:52 น.